I’ve enjoyed Red Hook beers in the past, so when i saw this one at a bar I thought I would take a gamble on it. 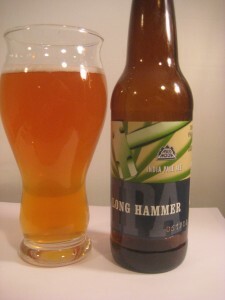 With a name like Long Hammer, I had hoped it would live up to its name. With a hard pour this beer had very little head and what head it did have quickly dissipated. This beer had a golden color, slightly carbonated with no head or head retention. Surprisingly for an IPA this beer had almost zero aroma. It had a very slight citrus sweet smell but not much beyond that… Very disappointing. For me part of the appeal of an IPA is the aroma. Fortunately this beer tasted slightly better then the aroma, it was slightly buttery, a little citrus, and the subtle flavors were rounded out by a dominant hop bitterness. A very mild IPA to say the least, hard to believe it was an IPA. If there wasn’t label on the bottle I would have swore up and down this was not an IPA.